Facebook emails in a different language – A Problem for Facebook users. Many people are complaining that their Facebook language changing automatically and Facebook emails in a different language. Most people are complaining that their Facebook language has been changed to Arabic, Polish, French, Vietnamese, and so forth with no reason. Go here and read every one of the remarks to get a thought what really matters to me. This problem of Facebook appearing in a different language can be solved. Many people are complaining that Facebook emails in Spanish and Japanese etc. 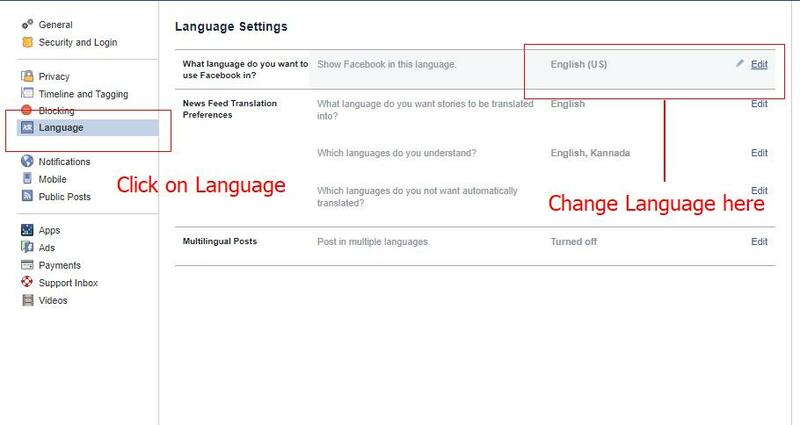 The most well-known approach to change the facebook language is to go at the base of the page and afterward change it by tapping the Language interface on Facebook settings. This strategy is supposedly not working for most people, when they change the facebook language utilizing this technique, it gets changed back to some other. This also works with change Facebook notification language on iPhone. Many people are complaining that Facebook notifications are in Spanish. Facebook push notifications are in foreign language. Facebook emails in different language problem also can be solved with this technique. Follow the steps from here and get rid of Facebook emails in a different language. Tap the arrow on the top right side of the Facebook menu, to the right of the Quick Help question mark. See the line which tells “What language do you want to use Facebook in?”, Click on Edit button. Choose a language you would like to have from the drop-down menu. 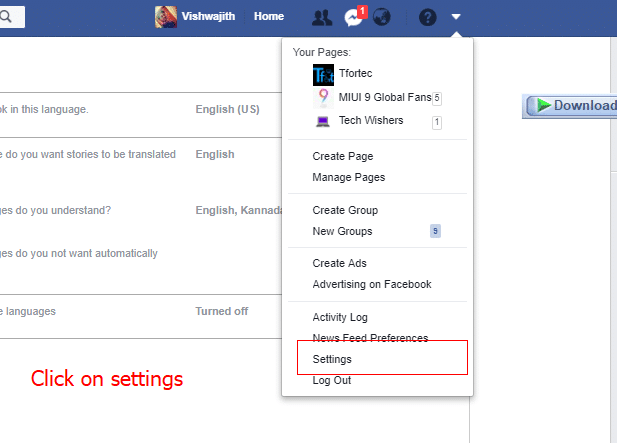 Click Save Changes button to apply the new language to Facebook. It’s done. Langauge changed. You can directly click on this link. This will take directly to your language tab. You should be already login to your Facebook account. You can also change notification language on iPhone. Go to your Facebook profile’s Timeline page. This is another way for solving Facebook emails in a different language. Scroll down till you get language section on top down side. Select the language and select one and confirm it with the Change Language.button that appears. Another way is to click the plus (+) sign to see all of the supported languages given there. This method also works best. There are best ways for facebook different language fix. This article was about Facebook emails in a different language fix. Please LIKE and SHARE this article if you like this article. Please comment your thoughts below.